Enjoy watching the majestic Dolphins in their natural habitat! This is one of our most popular tours! 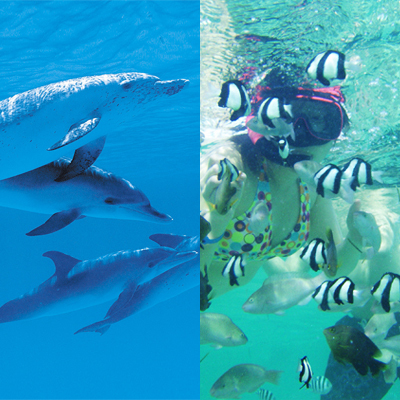 ABC’s Dolphin Watching tour includes bottom fishing and snorkeling. These activities may not occur depending on how much time it takes to find the dolphins, and other factors. Please understand that these are secondary activities to the main attraction which is finding and observing the Majestic dolphins. On the tour, you will encounter wild Spinner Dolphins swimming free in the beautiful open ocean. Try your luck at bottom fishing when the boat is anchored. Also, we offer amazing snorkeling if time permits in the crystal clear waters of Guam! 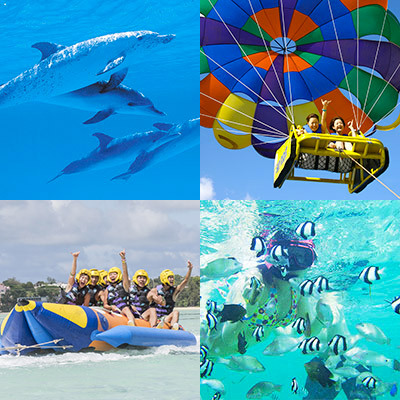 This is one of Guam’s most popular tours, and you can participate no matter how old you are! 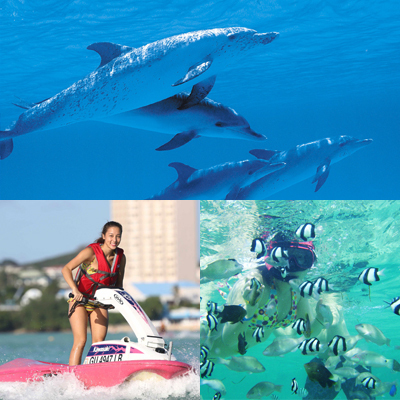 Have fun on Guam’s best Dolphin Cruise! Dolphins are some of the cutest and most majestic animals in the water. Some days they will come swim directly alongside the boat. If we are lucky they may become playful and perform acrobatic jumps and spins! 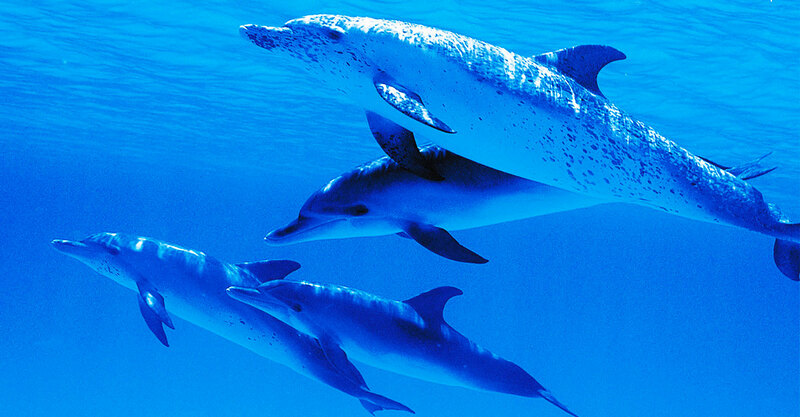 In most instances, you can observe the Dolphins from a distance of only a few meters. 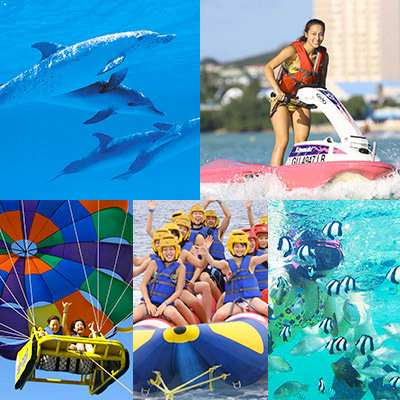 All are welcome to have fun on Guam’s best Dolphin Cruise. We have welcomed three-generations of the same family on the boat, so bring yourself, your grandparent and your child for a fun family tour! Cruise the ocean on a beautiful open concept dolphin watching boat. Our boat capacity is 74 people, so you don’t have to worry about space. The ocean water is so crystal clear that you can see many beautiful fish by putting on our masks and breaching the surface of the water! It is a unique and refreshing experience when you feel the sea breeze and fresh island air blowing on your skin. Our Staff will train you on how to use your mask and snorkel. While the boat is anchored, you can try sitting in the captain’s chair and take an awesome photo! There is no age limit for this tour. In the event of inclement weather, the tour may be interrupted, delayed or canceled. Please note that all activities, including the Dolphin Watching tour, are subject to weather conditions. Those who are under the influence of drugs or alcohol, or those who have physical ailments cannot participate. Those who are pregnant only available to join Super Beach Resort or Dolphin Watching Tour by self-responsibility. You may bring a camera, sunglasses, mobile phone, etc. However, since you may be splashed with ocean spray, please bring these items at your own risk. There will be a small space to store belongings on the boat. In the event of changing weather conditions and depending on the time required for finding and observing dolphins, captains may cancel the secondary free activities such as snorkeling and bottom fishing at the discretion of the captain. In this case, we do not refund, so please understand. We also offer a great plan combining several main activities. 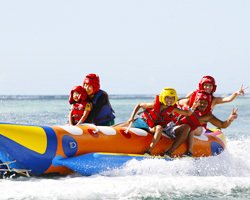 All packages include FREE Hotel transfer, All-you-can-eat Lunch and Super Beach Resort. *Those who are pregnant only available to join Super Beach Resort or Dolphin Watching Tour by self-responsibility. * Banana boat is not included in the above-mentioned child price. For our guests who purchase a main activity package from ABC can add the following items at a discount rate! You can enjoy this activity at ABC’s beachside facility. This tour can only be made at ABC on the day of your tour. Please meet at the 2nd floor deck area in front of the Gift Shop 5 to 10 minutes before the tour time. You will board ABC’s iconic pink bus and go to the Agat Marina which is about 25 minutes away. Take a commemorative photo before boarding or on board the boat, and depart from the Agat Marina! Please sign your name into the Ship’s log and Listen to the safety briefing and instructions of the crew! Then you will head out to find the pod of dolphins! If we find the pod of dolphins, we will observe them in their natural state. Then we will head depart for the snorkeling area. You can enjoy snorkeling toward the back of the boat and bottom fishing toward the front of the boat. Return to the Agat marina, and board the bus bound for ABC. Those who are planning on joining the snorkeling portion of the tour, please wear your bathing suit. Please bring a towel. The transfer bus takes about 25 minutes. It would be a good idea to wear some comfortable loose fitting clothes on top of your swimwear. You can come empty handed if you would like! However, it is convenient to bring comfortable loose fitting clothes over your bathing suit and a towel to dry off. If you are prone to getting motion sickness or had a fun night, please take motion sickness medicine in advance. You may bring a camera, sunglasses, mobile phone, etc. However, since you may be splashed with ocean spray, please bring these items at your own risk. There is a small space to store belongings on the boat. This activity is not scary. The boat is a large capacity boat, and it is very stable. How many people can ride in the one boat? The largest boat’s capacity is around 74 people. I can not swim, is it still OK? YES, it is OK for you to participate. For our snorkeling acitivities it is mandatory to wear a life jacket. Also, please listen to the instructions of our staff and follow their directions. Super Beach Resort is included in every purchase of package no.2~no.12.